Tottenham Hotspur travel to Craven Cottage on Sunday where they face a struggling Fulham side. Spurs go into the game looking to bounce back from their 1-0 defeat to Manchester United last week which saw them concede their 'title race'. Ahead of the clash, Mauricio Pochettino spoke to the press at Hotspur Way. The defeat to United saw Spurs crash out of their 'title race' and also allow fourth-placed Chelsea to close the gap to just one point. "I remember a few days before Manchester United it was the biggest game in the world and before Chelsea in the Carabao Cup. Always we create in our mind that it's the most important game, that we have ahead," he said. Spurs were held at bay due to a sensational display from David de Gea last Sunday as the Spaniard claimed another clean sheet. "Of course, it's so important to keep winning and bounce back again after the defeat to United. It's so important to show ourselves that we can compete and we cannot be affected by different circumstances that happened in the team. 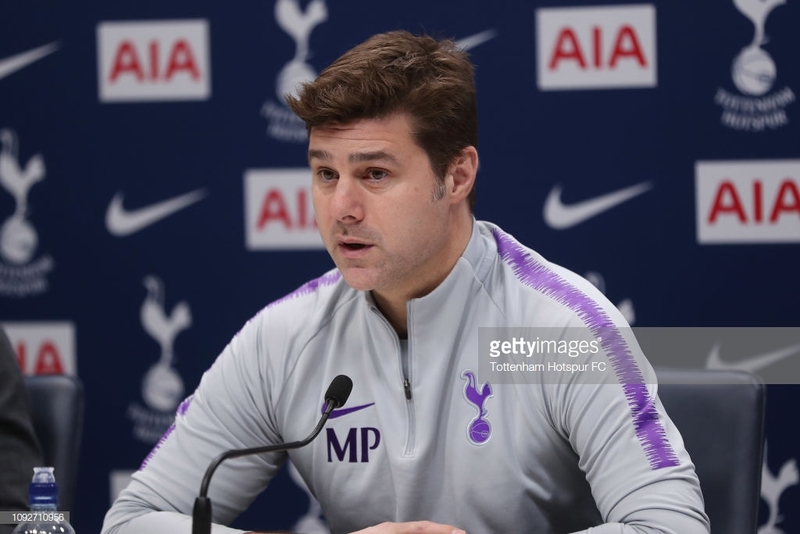 "That's important and of course we want all the players fit but these situations can happen and we need to be strong enough to show that sport is about collective effort and we have a very good opportunity to show that that is true," Pochettino added. Harry Kane suffered in the last seconds of the defeat as the 25-year-old twisted his ankle which caused ankle ligament injury. "I think he's very positive. Of course, we are going to see, the time to recover and have the full recovery." Kane has suffered from the same injury four times in the past four seasons. "But always it's an easy thing with Harry because he's a very positive person that in the moment he got injured started to think about his recovery as soon as possible. But of course, it's going to be an important player out for a time. He's one of the best strikers or players in Europe or the world and always it's going to affect the performance," the Argentine added. Mousa Dembele left the Club on Thursday for Chinese Super League side Guangzhou R&F. "I think he is a player and a person that we are going to miss. You know very well my feeling about him, he was one of the greatest players that I met in my career," the 46-year-old said. Dembele spent almost seven years at the north London side and made 249 appearances. "Of course, I wish him all the best, his wish was to move to China, his dream became a reality now. "It was a pleasure to share with him an unbelievable time here in Tottenham," he added. Borussia Dortmund 0-1Tottenham Hotspur as it happened: Mature Spurs performance sees them progress.